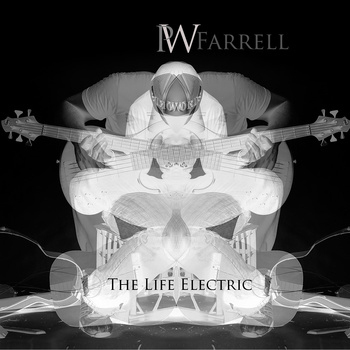 The inner sleeve art of bassist Patrick ‘PW’ Farrell’s debut album, The Life Electric, depicts the man – face obscured by a hip-hop cap – towering over the remains of a smashed and very dead acoustic guitar. He is holding his electric 5-string like the weapon that did the deed. It is a powerful image and a fitting one for an album that almost entirely eschews the woody acoustic (sound) world for the electric (and electronic) one. Apart from a little trumpet, sax, guitar and vocal spread thinly across the tracks (and ‘real’ drums on only two out of the ten here) all this music is performed and programmed by Farrell. The purists will yelp (which is never a bad thing) but in The Life Electric, Farrell has created one of the better albums of the year – at least to these ears. Charges of electronic ‘coldness’ and lack of human interaction and warmth will be leveled, but it never bothered Herbie or Miles, so it shouldn’t concern us. In fact the whole sheen of the album brings to mind some of Miles Davis’ 80s work, such as You’re Under Arrest and Star People – albums which have recently been re-evaluated as the masterworks they are. Farrell adds a very contemporary spin of samples and chattering computer beats to the mix, all of it done with as much taste as the best constructed Matt McMahon (or Steve Hunter) solo. But whereas fellow electric bassist Hunter – most recently on his live album Cosmos – moves through the music interacting with his band organically, Farrell gives his bass no less room to move, but istead plays inside a taut web of programmed beats and accents. 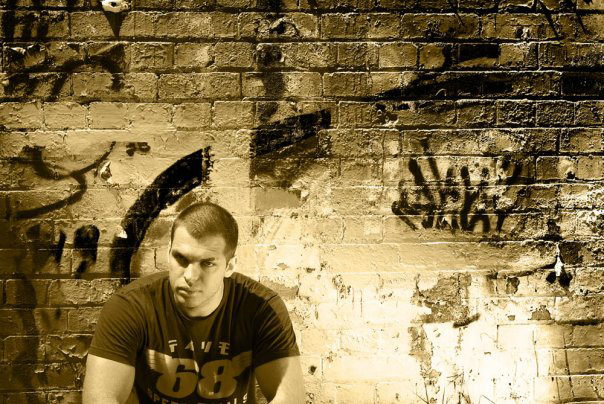 A startling instrumental technician – check the three unaccompanied pieces: ‘Irish Sons’, ‘Barcaldine’ and ‘I Have Wandered’ – Farrell will happily sit under on a hip-hop groove such as the title track, ‘The Life Electric’ or a lazily snapping lope such as ‘Inspiration’ (tenor player Daniel Rorke reading the mood perfectly in his solo). Instruments outside the sealed programmed tracks, such as Carl Morgan’s crisp-toned guitar solo on ‘Jester In The Rain’, never jolt against the computer sounds – it is all woven with great care and skill into a seamless and fine-grained fabric. When an element is meant to jolt, it does in a surprising and artful way – such as the sample of a Ronald Reagan speech on ‘Liberty’. The Life Electric is of its time but is also of the tradition of jazz. PW Farrell has caught the balance of both deftly – not an easy thing to do: too many have failed by tipping too far one way or another. His music deserves a listen. You would never have a Midnight Oil today. In a career that has spanned thirty years, The Oils have stepped on political toes, bit the corporate hand that fed them, always taken the hard line and have never taken a step back. As fan Tim Winton puts it, they “kissed no bum, tugged no forelock”. Nowadays the current bad boys of Rock put out their own range of light Chablis and try not to upset ClearChannel. Midnight Oil had a heart, a conscience and a very Australian larrikinism that spoke up for Everyman and bugger the cost. And they very nearly ruled the world. The Manly Art Gallery has mounted a new exhibition – The Making Of Midnight Oil – which charts their rise from bare-knuckle Northern Beaches pubs all the way to the largest stadiums in the world, playing to hundreds of thousands. The Making Of Midnight Oil takes us – with meticulous detail – from their early days as The Farm (Peter Garrett with hair!) 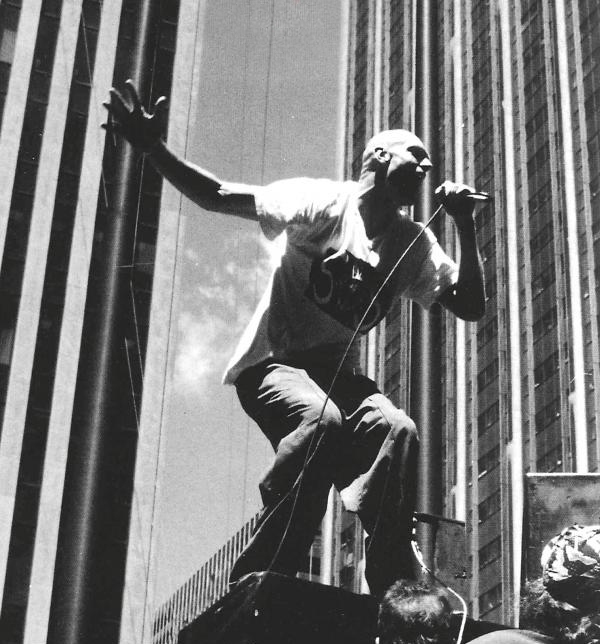 through to their infamous daytime protest concert outside Exxon’s New York corporate headquarters, where they played beneath a huge banner reading MIDNIGHT OIL MAKES YOU DANCE, EXXON OIL MAKES US SICK. (The banner runs along one whole wall of the exhibition – all thirty feet of it). But it wasn’t all sloganeering and eco-warriors – The Oils could rock like no other. In a golden age of Australian pub-rock, they stood out in sharp relief against contemporaries like Rose Tattoo and The Angels, largely due to guitarist Jim Moginie’s artful songs and arrangements which borrowed as much from classical music and surf music as they did from hard rock. The songs, combined with one of the toughest-sounding bands around – and fronted by a windmilled-limbed bald giant – created an unstoppable rock machine, but one with a sharp mind, and a fiery heart. (Drummer Rob Hirst joked that, here he was, saying ‘save the rainforests’ while smashing his way through thirty drum sticks every gig…). And you can see that the band worked, and worked hard. The exhibition is littered with scarred road-cases and guitar cases. Displayed are Martin Rotsey’s loved-to-death Fender Stratocaster and Jim Moginie’s road-wracked Gretsch Roc-Jet. On a small replica stage ­Rob Hirst’s bashed-in, vernacular drumkit is set up, complete with electric bin lids and percussive rusty water tank. There are walls of Midnight Oil posters and a wall of Midnight Oil t-shirts. There is Rotsey’s worn and beautiful Rickenbacker 12-string and there is Jim Moginie’s reel-to-reel into which were played the rough demos which would become anthems to the world. There is a clever little booth which, upon entering, takes you right back into the Oils’ early world of The Royal Antler, Narrabeen and the pounding, sweating, ecstatic warm-beer roar of their first Northern beaches gigs. Close the curtain and you are there – seventeen, half-pissed, soaking in the energy which the flailing bald giant is jolting into you, just you. The Making Of Midnight Oil captures the excitement of Midnight Oil perfectly and completely – the only possible thing missing is the band itself, it seems. Everything else is there. They were a remarkable band and an important cultural force, whose legacy has spread ripples right through to today’s music and right-on artists such as John Butler. But, no, you would never have a Midnight Oil today. Which is a shame, because in many ways, we need them now more than ever.